The ‘dramatic’ return of long queues at the filling stations in Lagos and some other cities centres is worrisome. But the authorities assure that there is no cause for alarm, The Nation Reports. DESPITE repeated assurances from state-run Nigerian National Petroleum Corporation (NNPC) that is has more than enough petrol to meet consumers’ demand; the long queues are back at the filling stations. Many of the stations ran out of stock over the weekend, leaving the few that have the product to dispense at prices above the approved N145 per litre. The scarcity worsened in Lagos on Sunday, a day the NNPC claimed it rolled in 250 trucks of Premium Motor Spirit (PMS) to Lagos in a move to ensure product’s availability. The fuel scarcity, which returned at the turn of last year, has been blamed on number of reasons including, panic buying; hoarding; sabotage and diversion of products to neighbouring countries by unpatriotic marketers. Though critical holders in the fuel distribution chain resolved at the end of their series of meeting in Abuja during the Yuletide to keep the pump price at N145 per litre, only few filling stations belonging to the Major Oil Marketers’ Association of Nigeria (MOMAN) dispense at the regulated price. Other stations have not only been hoarding the product to make the scarcity bite harder, they sell at odd hours to escape the hammers of officials of the Department of Petroleum Resources (DPR), who have been moving around to ensure that consumers are not cheated by the distributors. Hundreds of filling stations have been sanctioned by the DPR for offences ranging from under-dispensing of product, hoarding and to selling above the approved pump price. The fuel supply problem was aggravated by the withdrawal of members of MOMAN and Depot and Petroleum Product Marketers’ Association of Nigeria (DAPPMAN) from product importation. DAPPMAN’s chairman Prince Dapo Abiodun said the NNPC became the sole importer of product since October last year, when such venture became unprofitable for independent marketers. 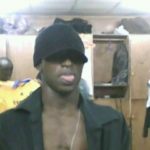 Besides, the DAPPMAN chief shed more light on the possibility of smuggling the product out to neigbouring countries where a litre sells for the equivalent of $1 as against N145 in Nigeria. The local exchange rate in is N365/$1. But the agencies of government are unrelenting in their efforts to ensure steady supply of the all-important product. 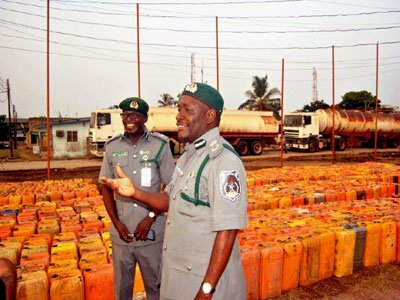 For instance, the Seme Command of the Nigeria Customs Service seized 22,000 plastic containers of smuggled petrol. The Duty Paid Value (DPV) of the products seized in Pashi Yekeme community, Owode, Badagry, was put at N10 million. Command’s spokesperson Selchang Taupyen said in a statement credited to the Area Controller, Mr. Mohammed Aliyu, that no arrests were made because the suspects fled on sighting law enforcers. 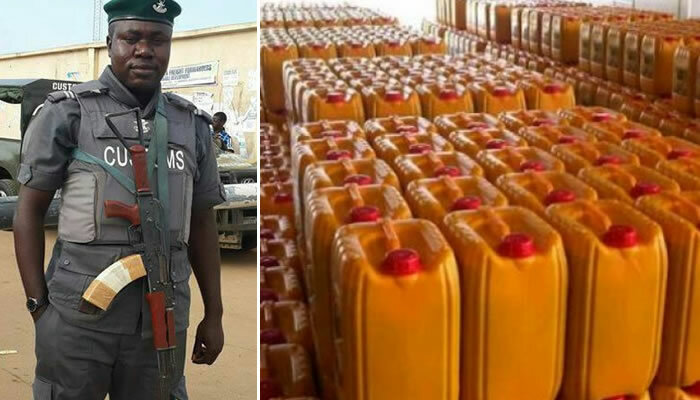 According to him, the products were seized by officers of the anti-bunkering unit while they were being smuggled through the creeks. The statement reads: “Our operational norm doesn’t allow trucks and tankers of petroleum products to cross the Nigeria’s territory, either through the Seme main border or its Owode Apa outstation. “The Owode Apa station is synonymous to every approved border post and it’s manned by all government security agencies. “Trucks are strictly monitored and documents are properly cross-checked to ensure that they are discharged to the approved filling station. He advised the public to desist from smuggling and embrace legitimate trade. “We are well equipped to tackle smuggling and we advise the public to desist from such illegal act or be ready to face the law” he said.